All the best things to do in Kashan put into one lovely list so you don’t need to do the hard work yourself. 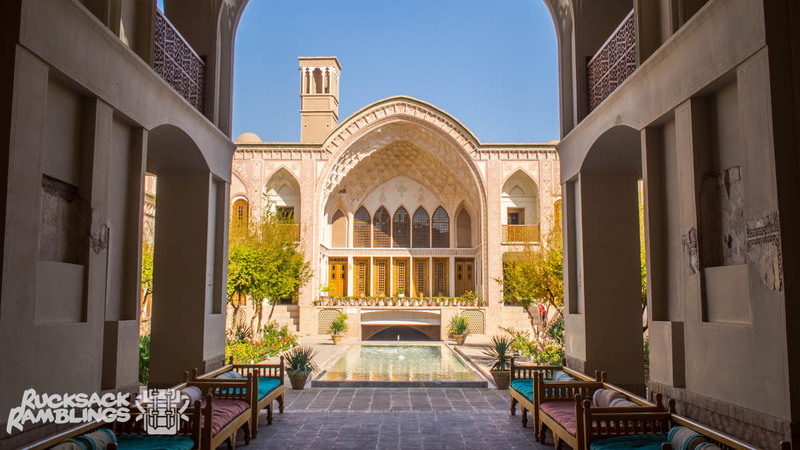 We even included tips on where to stay in Kashan at the end. Easy! 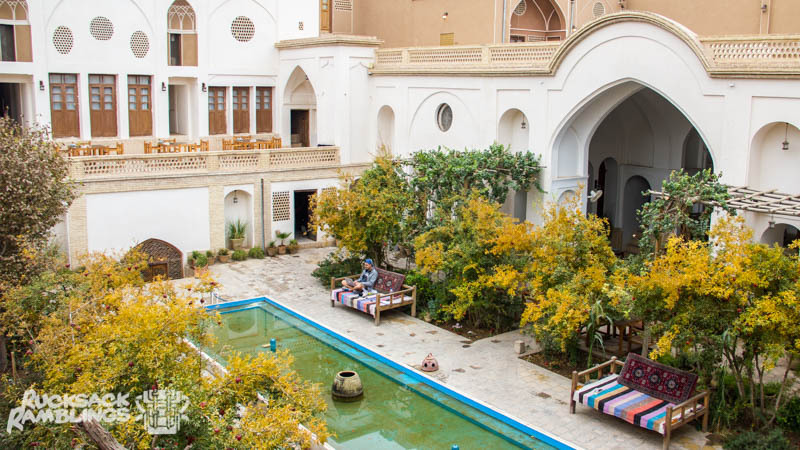 For many backpackers, Kashan is the first stop after Tehran. If that’s your case, you’re in for a surprise. The two cities have about as much in common as Nutella and Veggiemite do. Compared to Tehran, Kashan is a sleepy desert town with almost no tourists. But don’t let that fool you. Underneath this drowsy surface hides a proud city where history seems to lurk in every little crack. 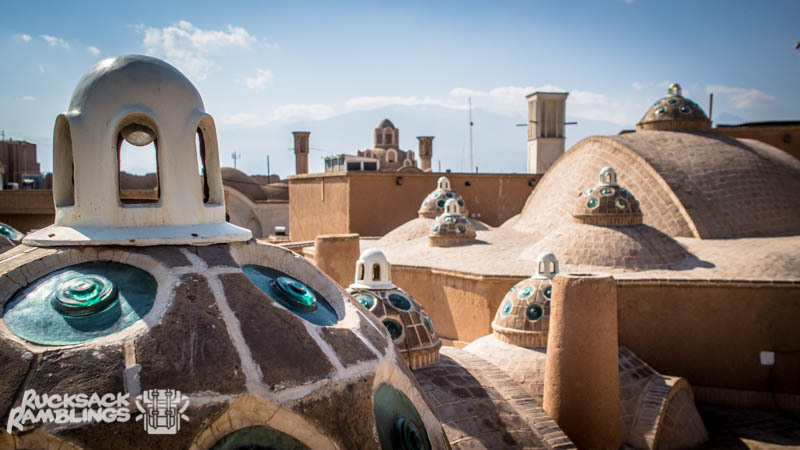 The fancy traditional houses bear witness to Kashan’s glory days on the Silk Road. 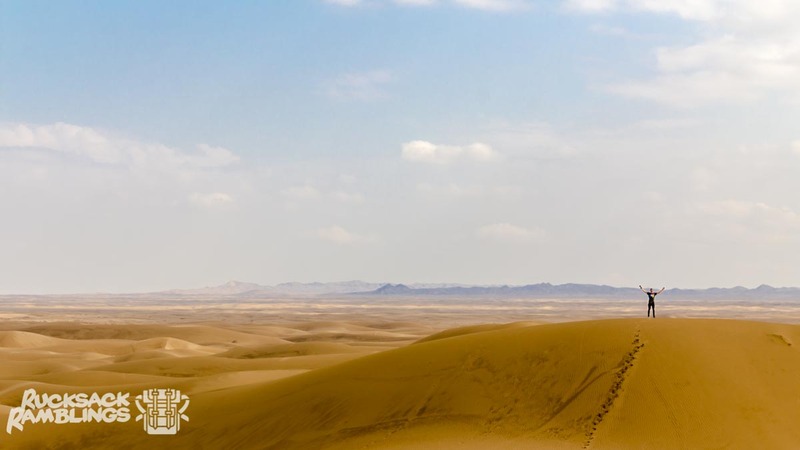 And if you like your history with a bit of nature, you can go explore the Maranjab Desert right next door. What’s not to love? Oh, and they’ve got some weird roofs. Yeah, you heard us. Roofs. 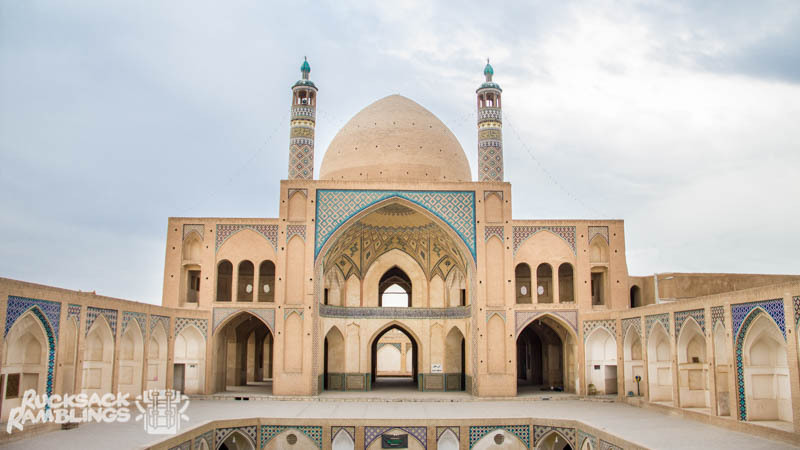 When we visited the Agha Bozorg Mosque, we were expecting to see another beautiful example of traditional Persian architecture. You know, hundreds of arches, colorful mosaics, perhaps even a stained-glass window or two. That kind of stuff. But not a volley court out back. Definitely not a volley court. Apart from this fun little surprise, the Agha Bozorg Mosque is a typical Iranian mosque. In fact, it’s praised as one of the greatest mosques from the 18th century. The front courtyard is flanked by rows of windows and rooms in perfect symmetry. Like a Babushka doll that keeps giving, there’s then a second courtyard inside the first one with trees and fountains. Grab your camera and head there around sunset for some sweet pictures! If you ask a local about the best things to do in Kashan, he’ll probably send you to their traditional houses. Don’t feel like spending an entire day looking at old stone reliefs? Fair enough. Just make sure you check out Khan-e Ameriha and Khan-e Tabatabaei. They’re worth it. Alright, not literally. But it’s pretty close. Here’s the deal: the roof of the Sultan Amir Ahmad Bathhouse is pretty unreal. It’s located close to the traditional houses and, in our opinion, the roof is just as impressive. Start by strolling through the bathhouse itself. 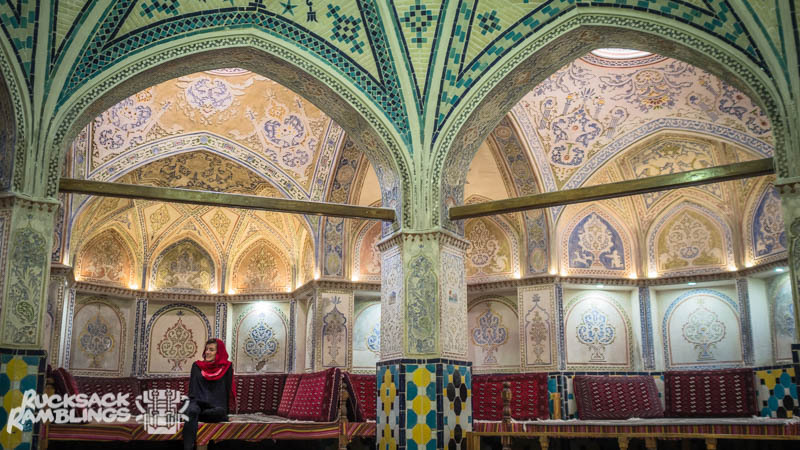 If you haven’t been to an Iranian bathhouse or hammam before, you’ll be impressed by the elegance in there. As you walk along the winding labyrinth, you’ll enter big bath halls decorated with stunning turquoise and gold tiles. When you’re done getting ideas for some serious bathroom makeovers, head up on the roof or, more precisely, the planet of Mars. It’s a whole different world up there. You’ll see these weird domes with small windows all over the roof. They’re there to let light into the bathhouse below and whoever came up with their design should get some sort of medal. This is probably the only time in your life you’ll use the word “fun” about a roof. The entrance fee is 150,000 rial but if you sweet talk the guard, you might make a little deal. And we’re not done with the roofs yet! 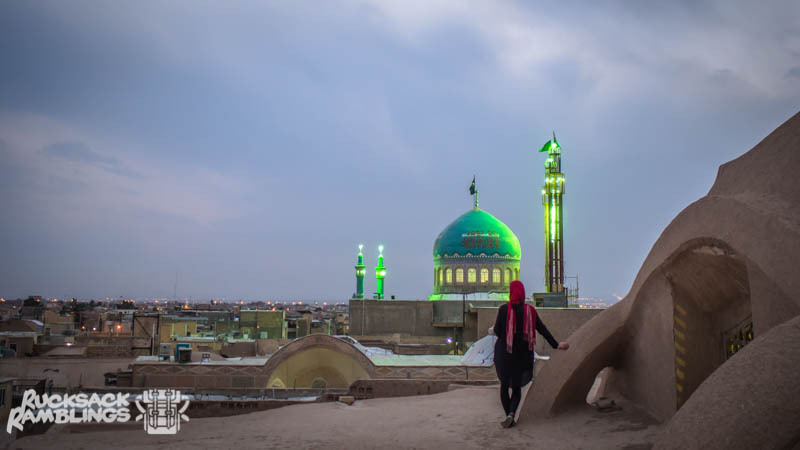 Going on the roof of the local bazaar is definitely one of the best things to do in Kashan. It’s similar to the one at the bathhouse except the view is much better. If you want the full experience, you should head up there just before sunset. Don’t forget to peek through the windows of the big dome to see the inside of the bazaar from above. It’s a bit like watching a real-life game of Sims. Anyways, getting on the roof is a bit of mission. As budget backpackers, we, of course, tried to do it for free, but it turns out you’ve got to ask the right guys. In our case, we asked a tea-seller who was definitely the wrong guy. We ended up paying 100,000 rial or $3 each. It’s not going to break our piggy bank, but if you do a little research, you can get up there without a guide. The bazaar itself is considerably less hectic than the Grand Bazaar in Tehran. That means the chance of locals striking up a conversation is bigger. We chitchatted with a group of English students for a good half hour when we sat down for tea. That’s the beauty of the Iranian bazaars – you never know what can happen! Now, we don’t normally do tours, but the thing is that some of the best things to do in Kashan you won’t be able to see in one day by public transport. Dasht-e Kavir Salt Lake (Namak Lake): pretty cool salt lake in the middle of the desert. Just make sure you don’t go after it’s rained because you will then be looking at a mud lake instead. Shrine of Hilal Ibn Ali (reachable by public bus): massive mausoleum that’s definitely worth a visit! Also, female backpackers get to wear a fancy chador. Nooshabad (reachable by public bus): a 1500-year-old underground city that it takes less than 15 minutes to walk through. The entrance is a bit rich at 200,000 rial, but it is moderately fascinating. Typical clay fortress: not something to rant about, but at least it’s free. If the kids in the schoolyard next door spot you, they’ll be waving and yelling “hello” for the entire time you’re there. PS. There’s a fair bit of driving involved if you go for the full tour. Bring patience and good music. This is another on of the classic things to do in Kashan. The Fin Garden or Bagh-e Fin is actually the oldest still-existing garden in Iran and it dates all the way back to 1590. Besides that, the garden is also famous for being the place where Amir Kabir, an important politician from the 19th century, was assassinated. Personally, we weren’t blown away. The entrance is 200,000 rial per person and we didn’t think it was any different from the many other gardens you’ll see when backpacking in Iran. If you’re into plants and fountains and have a few coins to spare, go for it. If not, don’t worry, you’re not missing out on much. The Fin Garden is only 8 km outside of Kashan, so if you’re up for it, you can bike there. If that’s too much work, there’s also a public bus (remember to buy the ticket before you get on) or you can catch a cab. It’s time for another yellow cab adventure! 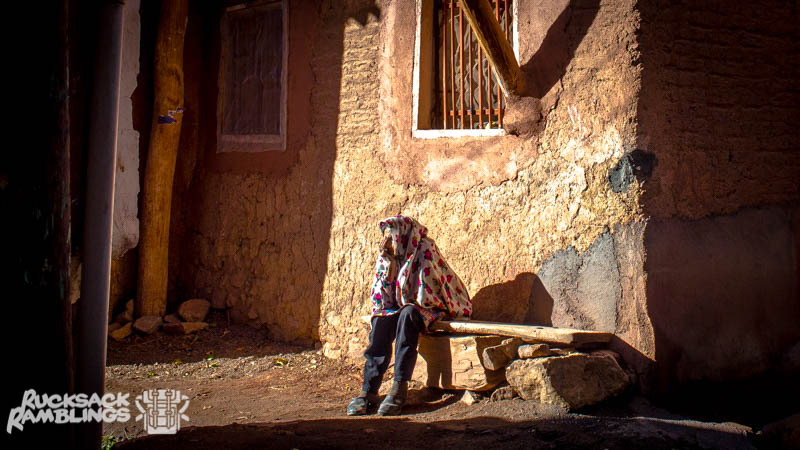 Abyaneh is a tiny mud-brick village hidden in the mountains between Kashan and Isfahan. The cheapest and easiest way to visit Abyaneh is to do a taxi tour from Kashan to Isfahan. If you take a tour, you’ll also make a few other fun stops on the way. It is possible to get there by public transport but you’ll have to change buses and it will end up being more expensive. Because of Abyaneh’s isolated location, its people still speak a Farsi dialect that died out in the rest of Iran centuries ago. They also have a solid fashion sense up there. The men wear traditional wide-bottomed pants and the women wear these gorgeous hijabs with embroidered flowers. There’s a 50,000 rial or $1.5 entry fee and the main thing to do in Abyaneh is to get lost in the narrow alleyways. There’s not a whole lot going on, but that’s part of the charm. All you hear is the wind and the footsteps of an old woman scuffling along. Oh, and don’t forget to climb the hill in front of the village! The view of the mud houses against the mountains is pretty sweet. Ehsan Historical Guest House is super charming! Most rooms are set around the beautiful courtyard and you get a good mix of backpackers and older travelers. Mixed 6-bed dorms are $15 per person including decent breakfast and half-decent Wi-Fi. Noogli Hotel is across the road from Ehsan. Rooms are $10 per person and you get a 30% discount if you stay 3 nights and do a tour. It lacks atmosphere, but it’s great for budget backpackers looking to save money. Saraye Ameriha Boutique Hotel – ha. Just kidding. You’re going to have to part ways with an internal organ to afford this one. Rooms are $60 a night and the price includes a breakfast buffet and golden slippers covered in the magical tears of a thousand unicorns. There you go, friends. You are now ready to hit up all the best things to do in Kashan. Smack on a pair of walking shoes and get out there! Do you have any cool suggestions for things to do in Kashan? Or do you just want to say hola? Drop us a line – we love making new friends!